CTA buses 4329, 4350. 1763 are lined up on the lower level of ORD Terminal 5 along wi t.f h a parking lot shuttle bus. Earlier I spotted 178 on upper level Termial 1. CTA 1761 is behind another parking shuttle at Temial 5. O suppose CTA s supplementing the All Terminals shuttle..
Looks like Coninental Air Transport (airport Express) is helping out at ORD. They are using MDW parking lot shuttle buses at ORD . They are 30 ft Eldorados. I guess they are EZ Riders though they look like the Axxess in the front. They also have rear doors. There are 2 of them operating along with CTA artics 4331, 4359, 4376, and 4365. They are using MDW parking lot shuttle buses at ORD . They are 30 ft Eldorados. I guess they are EZ Riders though they look like the Axxess in the front. As depicted on the ENC site, and exemplified by the new Schaumburg Trolleys, the EZ Riders now have the same front and back as the Axess. They are running some non CTA New Flyers at ORDinTeminal service. 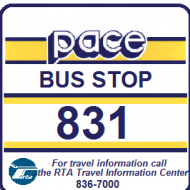 Bus numbers like S-1021 and S-1028. The legal lettering shows Continental Air Transport. It appears there could be 20 buses being used, S102X/S103X. Apparently they are replacing the CTA artics as I haven't seen any out at ORD this week. Also strange that Continental, and not Delaware (which has the O'Hare contract) , is providing the extra equipment. These are 40 ft New Flyers which wouldn't be necessary at Midway. Although the legal lettering says Continental Air Transport, they don't own any buses, per se. The MDW contract they have is a joint venture with Cook County School Bus and I believe they actually operate the business. Spoke to someone today who turned out to be an ATS mechanic who works on the cars. She said 6 of the new ATS cars have been delivered so far. I thought I saw one but most of that view was somewhat obscured. I can tell you he car is like a navy blue. Trying to piece together this puzzle, it looks like the ATS has contracted with Continental Air Transport to provide shuttle buses for the Terminal Shuttles. These New Flyers only serves all of the O'Hare terminals. The Delaware buses serve the terminals, economy parking lots, and the Metra O'Hare station. The New Flyer buses are parked at the ATS facility when not in use. Delaware parks its buses in G Lot. Delaware also provides some buses that operate terminals only shuttles, though I'm not sure if they bill the City or ATS for those. though I'm not sure if they bill the City or ATS for those. What legal entity is ATS? I'm fairly sure this is a Chicago Dept. of Aviation project. I saw another of the new ATS cars, #48, being delivered yesterday. When I get a chance, I will dig deeper and get some clarity. The city contracts with the company that runs the ATS providing service from the economy lots to al terminals. Through a source with Continental, that company subcontracted the shuttle work from the city to Continental. What I didn't yet verify ( I forgot) is whether ATS ( or whatever legal entity they are) or Continental is leasing the buses. There are four 3 car consists of new ATS cars on site so far. The legal entity of the ATS operator is O'Hare Airport Transit System. They ar the ones that are leaving the buses. Continental Air Transport provides the drivers. Again, had you taken into account the extension to the rental car facility? 18 spares is too much. Does it say anywhere that the stations will expand? The new terminal appears to be bigger than 3 cars. No the new terminal isn't bigger than 3 cars and even if it were, the other stations aren't. The stations won't expand, but when everything is ready, you will have 3 car trains operating on head ways of 2 to 4 minutes. Spotted the new ATS cars today. I wonder when do they go in service? I'll probably go out there tomorrow. I want to see the rental car facility first hand. You know I drove past, the Pace buses still use the old terminal. I wonder if theres any plans to go to the rental car facility? A sea of New Flyer buses serving the parking shuttles pull out of there. I wonder what happened to the old buses? I wonder why those guys are not using the ats? Pace will move to the rental car facility once the ATS extension opens. IIRC, the regional buses will also move over. Whoa wait a minute. Are you telling me they opened the facility without running the ats to it. That is downright psychotic. Haha, have Chicago talk to the peeps running the show at Seattle’s Airport. Their rental car center is about the same distance from the terminal, but there’s no train at all. Not even a dedicated way for buses to get there, and the route is a winding mess on surface streets to the building. But there are plenty of packed Gillig buses to ride in, provided you can wait until the second or third bus. At least they’re hybrids.